I use lavender oil in tons of ways. It’s super gentle and smells so good. Plus it has some really great benefits. It can relax and calm your nerves. It can soothe your muscles and relieve pain. You can even use lavender oil to relieve angry skin and eczema. Not to mention, there are studies that show it can help with hair loss. It’s true! Lavender is the one true queen of essential oils… It’s like the Beyoncé of oils! Haha! Before I get into the ways I use lavender oil, you should know I’m no fan of putting essential oils directly on my skin. I’m way too sensitive for that. And if your oil is older or oxidized, it can sensitize your skin and cause you to break out. I don’t want you to be covered in tiny bumps! So I suggest diluting the oil before applying to your skin. And remember to patch test! ALWAYS patch test! (#1) Whether you’re doing yoga or a quick workout, add 5 drops of lavender, 3 drops of peppermint, and 3 drops of orange oil to your diffuser. Peppermint and orange have bright scents that wake you up, while lavender makes sure you aren’t starting the morning at an anxiety level 10. (#2) For an early morning jog, add 3 drops of lavender and 2 drops of peppermint to your diffuser jewelry before heading out. Take a whiff ever so often. It’s wonderful! 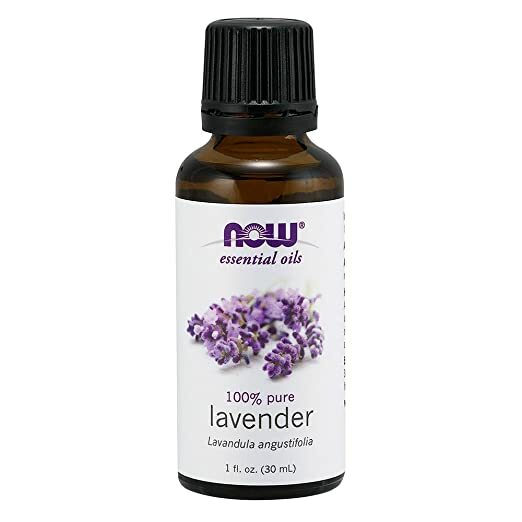 (#3) Add 2 drops of lavender oil to a cotton pad and place it in your shower caddy or shelf. While you shower, the warm steam will vaporize the oil and fill the space with a relaxing, beautiful scent. If you have sinus congestion, it will certainly help open up your airways. Don’t forget to breathe deeply! (#4) Add 1 drop of lavender and 1 drop of tea tree oil to your shampoo. Mix them up and apply to your scalp and hair. Both lavender and tea tree are proven against hair loss. And they are anti-fungal too; so no more dandruff for you! (#5) Instead of tea tree oil, add one drop of rosemary oil to your shampoo along with lavender. Rosemary is another really good anti-fungal oil. And a 2% rosemary oil blend had comparable results to 2% minoxidil, according to this study. Use lavender oil in your own homemade body scrub. And there are loads of recipes you can try. (#6) Mix 4 ounces of coarse sugar to 2 ounces of your favorite carrier oil – like coconut, jojoba or safflower. Add 10 drops of lavender oil and 5 drops of tea tree oil. You can also cut two Vitamin E gel capsules into your scrub. Use the scrub and store the rest in the fridge for another day. If you are using coconut oil, you don’t have to heat it before mixing. It will dissolve in the sugar and mix nicely. But coconut oil is comedogenic, meaning it can cause acne. So if you have acne or back acne, I don’t recommend it for your body scrub. Try safflower or jojoba oils instead. They have really low comedogenic ratings. (#7) If you want to try a salt scrub instead, add 2 ounces of pink Himalayan salt to 2 ounces of your preferred carrier oil. Finally, drop in 10 drops of lavender oil to your scrub. Scrub away! You can use other scrub essentials too. Add in a handful of oats, or a spoonful of honey. Try a dash of cinnamon and springs of rosemary or thyme. The scrub sky is the limit! The deodorants here are not antiperspirant. Personally, I don’t use antiperspirants because I want my body to sweat, remove my toxins and cool me down. These recipes don’t stop sweat, but they do stop odor. (#8) Incorporate 4 ounces of coconut oil, 2 ounces of baking soda and 2 ounces of arrowroot flour or corn starch. To this add 12 drops of lavender oil and 12 drops of tea tree oil. Use just a little on your sweat spots. I use it all the time. The baking soda masks any odor. The arrowroot flour keeps my armpits dry. And the oils makes them feel soft, supple and clean. And I still smell great even after a long day. Thanks to lavender! (#9) If these ingredients are too harsh for you or if you want a deodorant that will keep you dryer, check out this mix from soapdelinews. It asks for refined shea butter, emulsifying wax, coconut oil, neem oil, bentonite clay, arrowroot powder, magnesium hydroxide, lavender oil and tea tree oil. It takes some work, but it’s a nice deodorant too! (#10) If you are looking for a roll on perfume instead, use this one. Fill your roller bottle to 95% capacity with your favorite carrier oil. You can try jojoba, almond, coconut or any other non-greasy carrier oil. Add lavender essential oil to fill in the remaining space. You can also add a couple of drops of lemon or bergamot too. But be careful. Sometimes they can be phototoxic if they’re exposed to a lot of sunlight. Here’s another favorite of mine. A lavender perfume spray! (#11) To a small spray bottle, full half with water. Add alcohol (vodka or ethanol) until the bottle is 3/4 full. Add 1 teaspoon of a light carrier oil. I use almond oil. And then use 10 drops of lavender oil. 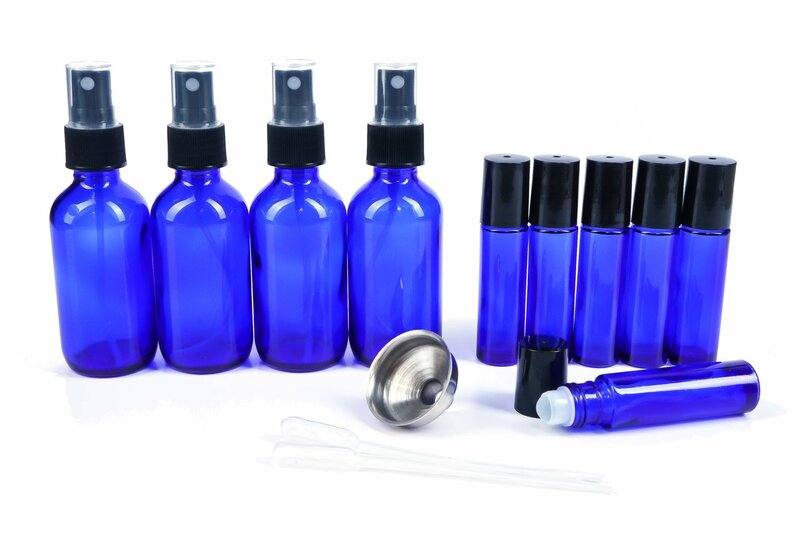 You can vary the amount of almond and lavender oil based on the size of the spray bottle you use. Be sure to shake well before you spritz your clothes. The whole point of this spray is to ensure it evaporates quickly, hence the alcohol. And almond oil is added to make sure undiluted lavender doesn’t touch your skin directly. 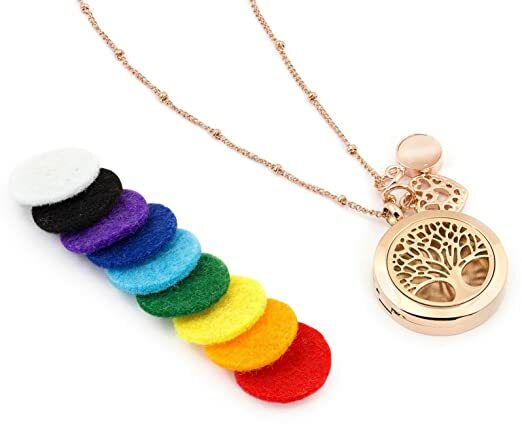 (#12) Instead of car air fresheners, I use lavender oil. I add about two drops of the oil to a cotton ball and place it in my cup holder. You don’t want to use too much lavender oil, since it is super relaxing. And you can’t be too relaxed when you’re behind the wheel. So two drops are enough. If you are lucky enough to have your own office or if you are able to use a diffuser at work, then there are tons of lavender blends you can try to keep calm at work. No more work stress for you! (#13) Here’s a great diffuser blend you can try. Three drops of clary sage essential oil and three drops of lavender oil. That’s it. According this 2013 study, clary sage was found to be more calming than lavender! And both combined? Say goodbye to work stress! Petitgrain is another proven essential oil for stress. This 2017 study found the oil reduced stress, increased attentiveness and alertness, and improved performance in the workplace. (#14) So try a blend of two drops of lavender and two drops of petitgrain. (#15) If you can’t diffuse at work, then you can make your own inhaler. You can get empty inhalers with little cotton inserts on Amazon. Add two drops of clary sage, 2 drops of lavender and 1 drop of ylang ylang essential oils. These oils are all great for staying calm and relieving stress. Feel free to play around with other oils too. Try a lavender, frankincense and spruce combination or a germanium, lavender, chamomile combo. They’re amazing. But it’s all based on your taste … well smell, really… and what you like. Or should I say bath time. There’s nothing better than having a lavender soak. It’s so very soothing, calming, and relaxing. (#16) I add five drops of lavender oil to a glob (about a teaspoon) of my shampoo before dropping it in the tub. I use shampoo to ensure the oil mixes well with the water. Without it, the essential oil will sit on top of the water and, when you get in, the essential oil will likely stick to your legs and bum. That could mean a bad chemical burn if you have sensitive skin! Shampoo isn’t your only option. You can try your favorite bubble bath or a carrier oil like coconut or jojoba oil. But, just so you know, a carrier oil may leave an oil slick in your tub, which would require a little extra clean up. (#17) Another great way to use lavender oil is in your own face mask (or hair mask too). To a tablespoon for flaxseed gel, add a tablespoon of your favorite carrier oil (like tamanu, jojoba, or safflower), two drops of lavender oil and one drop of tea tree oil. Mix everything up well to make sure the essential oils are properly and safely diluted. Apply the mask (it’s better to use a large makeup brush) to your face, neck, hands and even your hair. Let it sit for 10-15 minutes before washing it off. You will feel your skin getting tighter. It’s amazing! (#18) Do you vacuum often? Then try adding a cotton ball with three drops of lavender oil to the dirt bin of your vacuum cleaner. The cotton ball will stay in the bin but the smell will permeate the cleaner and your space. So you can really clean to relax! Use lavender oil in your linen sprays too. 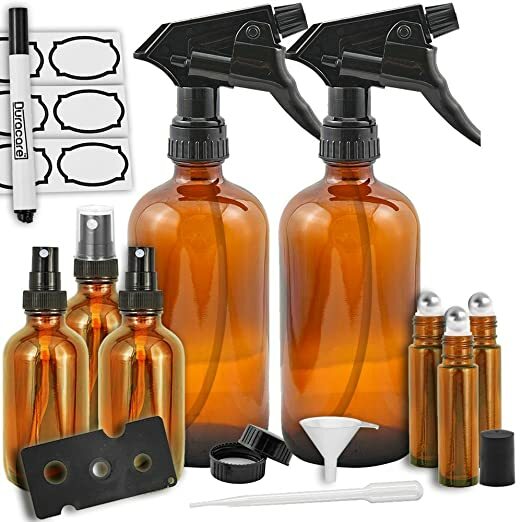 (#19) To a large spray bottle, fill three quarters of it with water, add a teaspoon of a super light carrier oil like almond or grapeseed oil, and then drop in 20 drops of lavender oil. To finish it off, fill the remainder with ethanol. Shake well and spray your curtains, couches (don’t use on leather), inside cupboards, shoes, smelly spots, and more. 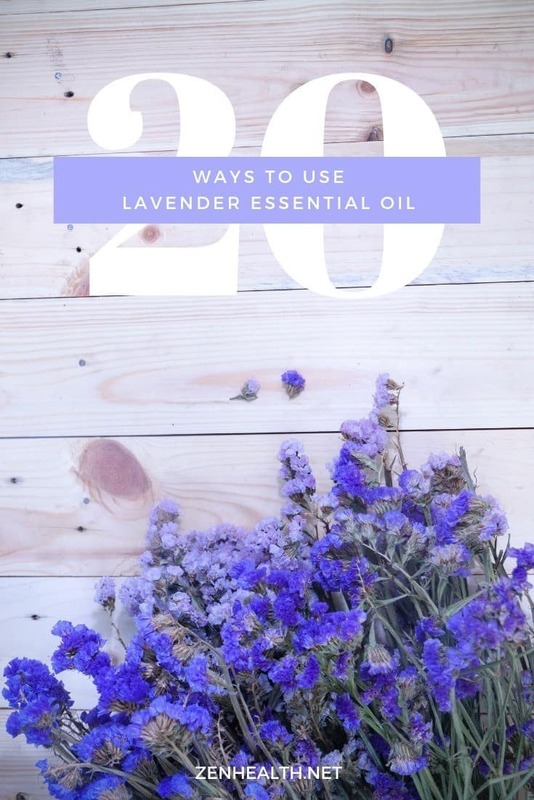 (#20) You can use lavender oil in a lot of ways to unwind before bed. But I find the best way is to diffuse three drops of the oil close to your bed an hour before you hit the sack. The smell will spread throughout the room and get into your pillows and bedspreads. You don’t have leave your diffuser on while you sleep. An hour diffusion is enough. You can also ditch your painkillers before bed too, since the oil does well to relieve pain, especially from headaches and migraines. In this 2012 article , researchers found inhaling lavender for 15 minutes was an effective and safe treatment for managing migraine headaches. 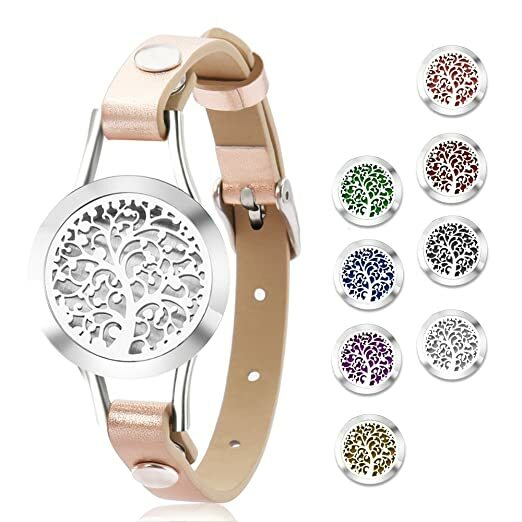 Disclaimer: This post contains Amazon affiliate links. Therefore, this site will earn a small commission for any purchases made using these links. I haven’t used lavender oil before, but with this post, definitely have to try it. Thanks for the education. SO many good ideas for lavender! We usually just use it in an epsom salt bath or before bed. I had no idea you could do so many things with it! Definitely trying the cleaning hacks asap!